There are delights of color everywhere, from nandinas and hollies putting out showy berries, tree leaves turning shocking shades of scarlets, oranges, and chartreuse, and the cool weather annuals more than carrying their weight in the gardens. We have our Holiday Open House coming up on December 9th, so the gardens will be ready for it! In fact, we spent most of November preparing for the holiday season. We take great pride and enjoyment in making the house as stunning for our guest's delight as we possibly can! But we didn't stop there, of course. The Parker County Master Gardeners came out and made handmade fresh-cut greenery garlands to grace our bridges, fountains, and front door! It truly is a winter wonderland spectacular, so mark your calendars for the Holiday Open House, or come out and see us on your own time! Once again, Chandor Gardens joins with the Parker County Heritage Society's Candlelight Tour of Homes to ring in the Holiday season! The Gardens and Mansion will be decorated in its Christmas best and open for everyone to see. This year marks the 36th anniversary of the Candlelight tour where Weatherford shows off some of its most beautiful and stately homes. 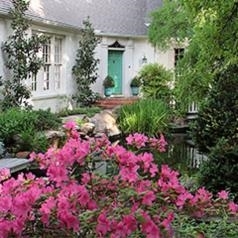 Although admission to Chandor Gardens is free, tickets will be required to visit the homes. They can be purchased on-line at www.parkercountyheritagesociety.com and picked up the day of the tour at the Doss Heritage and Culture Center. You can also buy tickets on tour day at the Doss or at the Weatherford Chamber of Commerce. We will have a variety of talented musicians and singers on hand throughout the day to entertain you with holiday music in the Great Room of the Mansion. As always, we will be serving refreshments and Santa will be here for the kids from 1:00 to 4:00 pm. Come on out to the Gardens December 9th and make some holiday memories! Where did this year go? 2017 has been a whirlwind of activity with all of the challenges of starting the new Chandor Society and it seems appropriate to remember the purpose of the Foundation and why the Chandor Society is so important to the Garden and the Community. If a garden is not loved and nurtured it does not flourish and the more of us who understand the historical significance, experience the beauty, and share a sense of pride that the Garden belongs to all of us, the stronger the support. 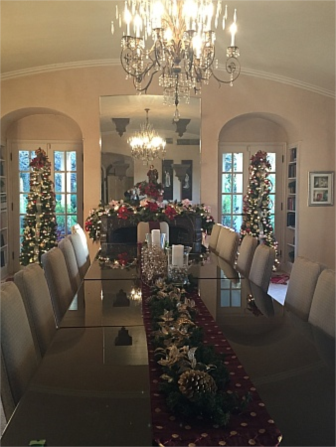 Chandor Gardens is on this year's CandleLight Tour on December 9th and the Chandor home is extravagantly decorated in Christmas finery. You can also visit the Gardens during regular hours. Either way, it is well worth the effort. 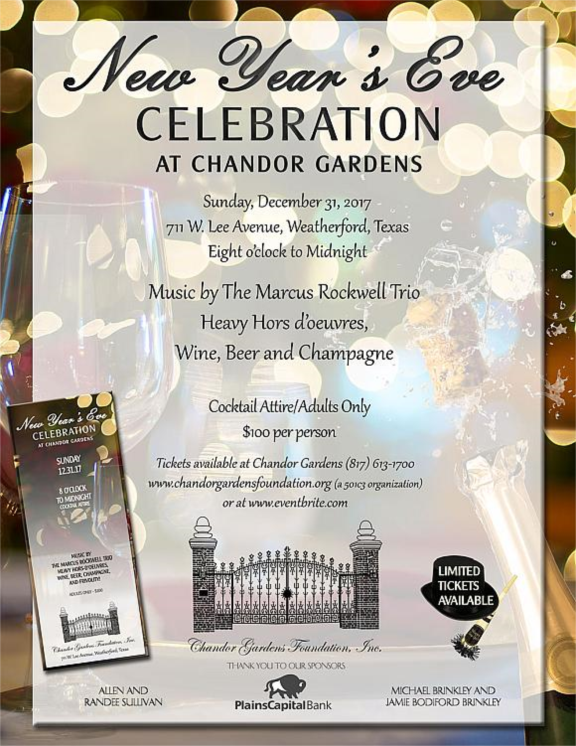 Don't forget to check the Chandor Gardens Foundation website (www.chandorgardensfoundation.org) for tickets to the New Year's Eve Celebration at Chandor Gardens with music by The Marcus Rockwell Trio. It promises to be an elegant evening and tickets are limited. All proceeds benefit the Chandor Gardens Foundation, a 501c3 nonprofit organization. 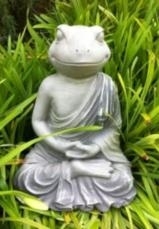 Tickets available at Chandor Gardens by phone 817-613-1700, or www.ChandorGardensFoundation.org, or through Eventbrite. 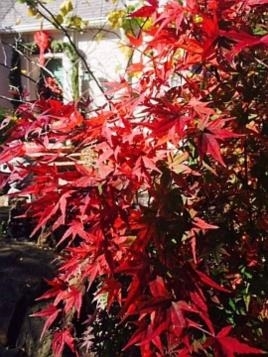 Our Japanese maples are looking stunning right now, especially our weeping cultivar. What this means is that the branches turn downward the way a weeping willow does, giving it a draping aesthetic rather than branching outwards the way traditional maples do. 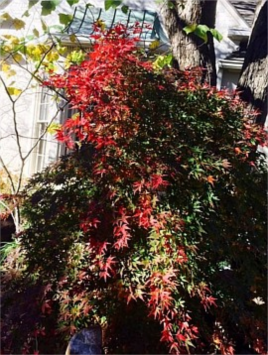 Japanese maples are a great addition to any garden because they look different with each passing season as their leaves vary between greens, deep purple, and shocking scarlet as seen here. In the cold of winter, it will drop its leaves to show the delicate bare branches draping down which is a beautiful sight to behold, especially if one has the opportunity to view it in a rare moment of a dusting of frost. At the moment, it, as well as our other Japanese maples, are showing off their fiery fall flair, and are definitely worth taking a moment to stop and admire this beauty from the east. 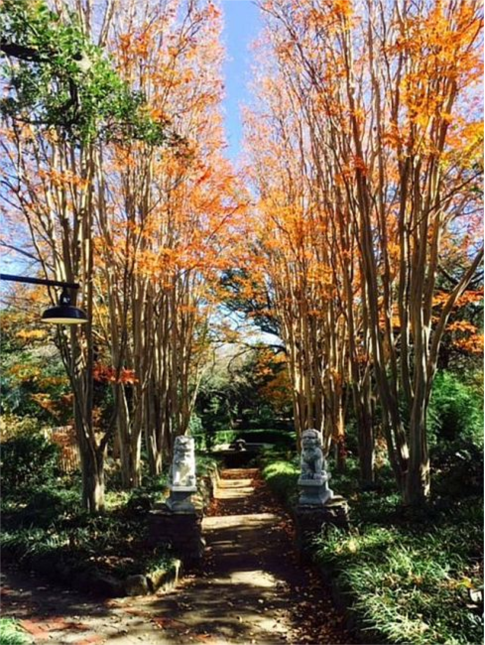 Fall is in full swing at Chandor Gardens as evidenced by our beautiful and proud Muskogee crape myrtles' bright display of sunset orange color. Muskogee crape myrtles are beautiful, and unusual for a crape myrtle, as they can reach heights of over 20 feet tall! They are a beautiful and architectural touch in the gardens. Dates are filling up fast for 2018 & 2019. Stephanie's position at Chandor Gardens is "Senior Office Assistant". Stephanie has been with us part time for 3.5 years, and has been full time for about 8 months. When asked about what her duties entailed, she said, "As Senior Office Assistant, I assist Karen in coordinating weddings and events. I do basically all our city events (Spring Fling, the Autumn Art Walk, Goblins in the Garden, etc. ), setting up dates and times for entertainment and vendors. Any administrative work, I take care of with Karen. Meetings and events go through me before being finalized. The job has a lot of little details to it, but I quite enjoy it!" 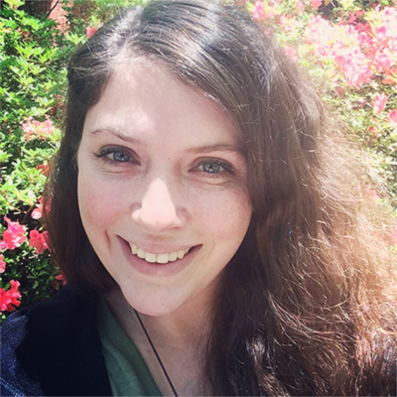 Stephanie is quite the hard worker, having undertaken a lot of the more crucial tasks since her promotion, and she does her job very adeptly. She always has the answer to some of the weirder questions and customer requests, and if she doesn't know it, she finds it out. She's also not afraid to try new methods, and has a knack for productivity. Stephanie is indispensable when it comes to decorating for Chandor's annual Holiday Open House (a two-week undertaking) that transforms the mansion into a literal winter wonderland. Her eye for decorating and organizing is a lifesaver at times, and makes her perfect for the job. While it seems that Stephanie is always here working hard during the week and at events, she does a lot of different things in her downtime. She states, "When I'm not at work, I love to read, and go to the gym. I'm also a movie buff, and I enjoy spending a lot of time with my family and my doggies, whom I adore. I have two dogs, Lucky, an 11-year-old poodle/Maltese miz, and Sasha, an 8-year-old terrier mix. I also played the bass clarinet for 10 years, so I'm musically inclined, and enjoy listening to music a lot." Indeed, she can often be found reading a book in her downtime. 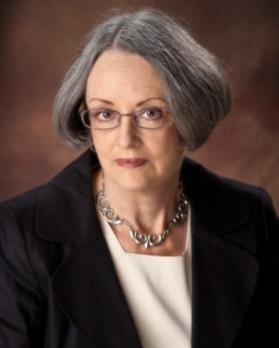 There is also a photo of her and one of her dogs on her desk, and she is always happy to talk about what they are up to and how sweet they are. Since Stephanie has been a valued team member at Chandor Gardens for several years, we thought she might have a funny favorite memory of working here. She took us a little by surprise then, when she told us the following: "My favorite memory working at Chandor Gardens would probably be this 50th wedding anniversary I coordinated for this couple a week or so ago. The Monday after their event, they called and talked to me for about 20 minutes about how great this event was, how awesome the staff and myself were at their event, and just how happy and grateful they were. I always appreciate seeing people be happy and satisfied, and that is just the most recent occurrence, but in all honesty, seeing people leaving happy after their event is finished is so rewarding. 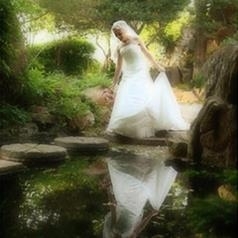 I really enjoy helping people and going the extra mile for them to have a great memory of their event. It's even more rewarding when it's something extra meaningful, like a wedding, or a memorial event, because these are major events in their lives, whether it's a celebration of love, or the bittersweet memorial of a loved one." That truly sums up Stephanie's heart and work ethic. It's true, we host a lot of different events, but for the majority of the family-oriented ones, they are usually for an important milestone in someone's lives, and she does not take that honor and responsibility for granted. Her favorite thing about her job is helping make positive, lasting memories for the people that come here, which makes her such an invaluable asset to the Chandor Gardens team. Here at Chandor Gardens, we really appreciate the wealth of diversity and experiences our staff brings to the table, so check back to see more installments of "Meet the Crew," as more will be coming soon! 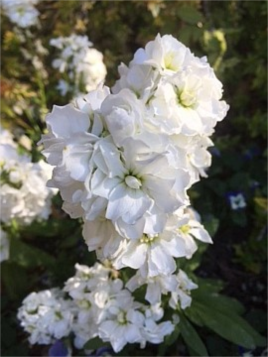 In addition to the fall and winter staples of pansies and violas, we have Matthiola incanas growing throughout the garden. 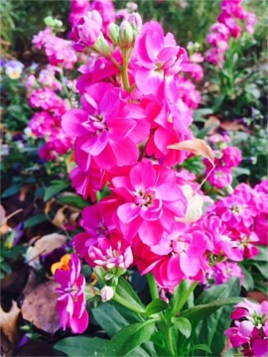 These cold weather hardy annuals are more than just beautiful; they have the most exquisite scent imaginable! You can smell their fragrance almost anywhere you wander in the gardens, and it is this that has earned its Plant of the Month status. It's not very often that one finds beautiful delicate blooms that smell redolent of spring in December. These beauties love their sun, and they love the cold nights, making them a perfect winter annual.